Hopefully you’ve had a chance to follow along with all our coverage of The Walt Disney Studios live-action presentation at our D23 Expo Hub, but now Disney has brought online some cool videos from the Disney, Marvel Studios and Lucasfilm’s Star Wars presentation as well. You can watch the videos below! 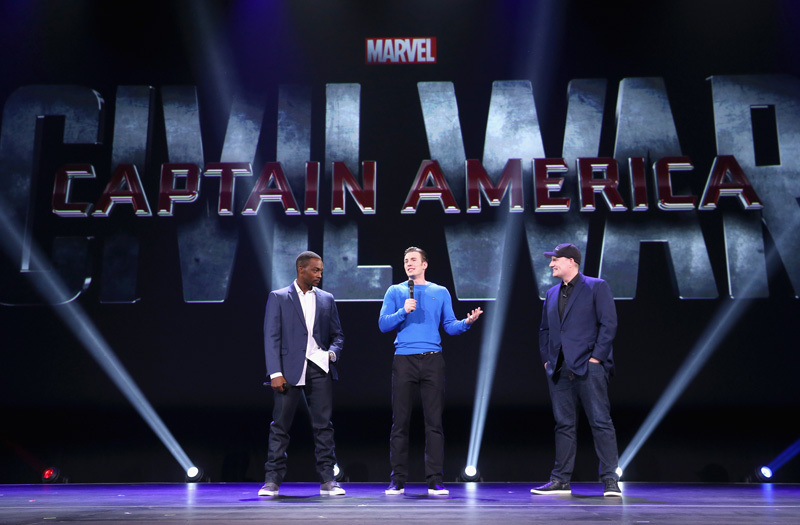 In the first video, Marvel’s Kevin Feige talks about the start of Phase 3 for Marvel Studios. Doctor Strange star Benedict Cumberbatch delivers a video greeting from London and Captain America: Civil War stars Chris Evans and Anthony Mackie introduce the first footage, which we’ve described here. The end of the video also includes Chris Pine introducing The Finest Hours. The following video features The Jungle Book director Jon Favreau and stars Bryce Dallas Howard, Ben Kingsley, Lupita Nyong’o and Neel Sethi, as well as Alice Through the Looking Glass star Mia Wasikowska. This new video features Bryce Dallas Howard talking about Pete’s Dragon, Lupita Nyong’o about The Queen of Katwe, and a video greeting from Emma Watson on the Beauty and the Beast set. A big one: Johnny Depp comes out as Captain Jack Sparrow from Pirates of the Caribbean: Dead Men Tell No Tales and J.J. Abrams brings the cast of Star Wars: The Force Awakens on stage, including John Boyega, Daisy Ridley, Lupita Nyong’o, Oscar Isaac, and yes… Harrison Ford! And last, but certainly not least, Bob Iger makes the big announcement that Star Wars Land is coming to both Disneyland and Walt Disney World’s Hollywood Studios!